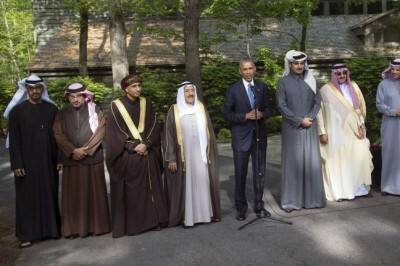 President Barack Obama Thursday played host to a collection of emirs, crown princes and senior ministers of the Persian Gulf Arab oil monarchies, a collection of dictatorial regimes that constitute Washington’s principal allies in the Arab world. The summit at Camp David was part of an increasingly clumsy balancing act by Washington as it attempts to conclude an agreement with Iran on its nuclear program and pursue the possibility of a rapprochement with Tehran. This policy is bitterly opposed by the sectarian Sunni monarchies, which view Iran as a threat in large measure because of their repression of their own Shia populations. The presence of only two of the six crowned heads that make up the GCC—the emirs of Kuwait and Qatar—was widely viewed as a deliberate snub of the Obama administration by the oil monarchies, expressing their hostility to the negotiations with Iran and concern that US imperialism could be weakening its decades-old commitment to defend these regimes as bastions of reaction in the Arab world. The most notable of the absentees was Saudi Arabia’s King Salman bin Abdulaziz Al Saud. Salman, who assumed the throne just last January, is widely reported to suffer from both Alzheimer’s and dementia and may not have been able to play any role in the talks in Maryland. In any case, he sent the two most senior members of his regime, his nephew, Crown Prince Mohammed bin Nayef, and his son, Crown Prince Mohammed bin Salman. Together they hold the reins of Saudi Arabia’s security and military forces. Bahrain’s King Hamad bin Isa al-Khalifa skipped the summit to join Britain’s Queen Elizabeth for a horse show at Windsor Castle. Disappointment in the Obama administration’s failure to come through with a formal US-Japan-style mutual defense pact for the Gulf monarchies may have played a role in the no-shows. In discussions last week in Paris with GCC foreign ministers, US Secretary of State John Kerry made statements that were interpreted by some in the region as suggesting that such an agreement was in the offing. Also expressing the Gulf regimes’ displeasure was a vow by a leading figure in the Saudi royal family, Prince Turki bin Faisal, the 70-year-old former Saudi intelligence chief, that Saudi Arabia would build up its own nuclear program. “Whatever the Iranians have, we will have, too,” he said on the eve of the summit. Iran has always denied that its nuclear program is intended for anything but peaceful purposes. The fear among the Saudis and other oil monarchs is that rapprochement with Iran combined with Washington’s “pivot to Asia” could lead to a downgrading of the US military presence in the region, which these undemocratic and widely despised regimes regard as essential to their own survival. In what appeared to be an indication of the absence of substantive progress in the Camp David talks, Obama said that he was going to “make sure this is not just a photo opportunity” by organizing a similar session next year. The summit served mainly to underscore the bloody catastrophe that US imperialism has wrought in the region and to expose the gross hypocrisy and duplicity of the rationales used to justify Washington’s policies. Obama declared that he and the oil emirs and princes had discussed close collaboration in the struggle against “terrorism,” in the process lumping Iran together with Al Qaeda and the Islamic State of Iraq and Syria (ISIS). In reality, ISIS and Al Qaeda’s Syrian affiliate, the Al Nusra Front, have become the principal fighting units in the bloody sectarian struggle for regime change in Syria, precisely because of the substantial financial and arms support lent by the Sunni oil monarchies, with Washington’s collaboration. And for all of Obama’s talk of defending the countries of the region against outside aggression, his government is providing critical logistical and intelligence support along with the bombs and missiles that have been used to turn much of Yemen into rubble, in a criminal war of aggression that has killed over 1,400 Yemenis and wounded another 6,000, the vast majority of them civilians. He said that this would take the form of increasing “already existing security operations” with more frequent military exercises and other measures aimed at building up the security forces in these dictatorial states. He said that this would include the promotion of “rapid reaction forces” for “peacekeeping” missions. The precedent for such operations was set when Saudi Arabia sent tanks rolling into Bahrain in 2011 to suppress protests by the oppressed Shia majority in that Sunni-ruled monarchy. He also said his administration would “streamline and expedite” the massive flow of US weaponry into the region, promoting an integrated regional anti-missile system, which will spell massive profits for Lockheed Martin and other US arms merchants. For all the talk of an Iranian threat, the Gulf monarchies spent some $100 billion on armaments last year, compared to $15 billion for Iran, which has three times as many citizens as all the GCC countries combined. Keeping a straight face, Obama said he and the emirs and princes had also discussed the importance of “inclusive governance” and “human rights.” In virtually every one of these states, torture, the suppression of free speech and assembly, the imprisonment of political dissidents and brutal executions are the favored means of propping up their ruling royal families. Obama’s rhetoric notwithstanding, they do so with the close collaboration of the CIA and the Pentagon.